Most of us will make a New Year’s resolution – often to lose weight, exercise more or eat more healthily – but only one in 10 of us will achieve our goal. Psychologists have found we’re more likely to succeed if we break our resolution into smaller goals that are specific, measurable and time-based. Professor Richard Wiseman, of the University of Hertfordshire, tracked 5,000 people as they attempted to achieve their New Year’s resolutions. 10% of participants in the study who had achieved their target broke their goal into smaller goals and felt a sense of achievement when they achieved these. 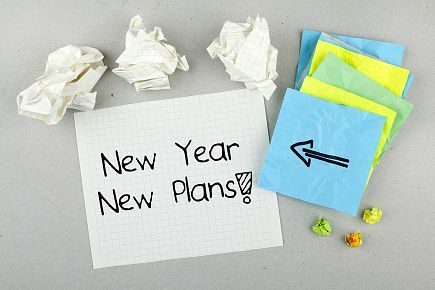 – Make realistic resolutions that you will be able to achieve. Don’t set yourself up to fail. – Make yourself accountable – share your goals with someone else. They will be able to support you, and guilt can be a powerful motivator! – Break the resolution into small steps. This will give you a sense of achievement when you achieve these, rather than looking towards a distant long term goal. – Remember to reward yourself for success as part of your plan. It could be something as simple as a trip to the cinema. – Expect the occasional hiccup. If you overeat at a party, or miss a few exercise sessions, you don’t need to abandon the plan. Just refocus and start again. Ten weeks has been shown to be the period after which making a change in lifestyle starts to become normal behaviour. Unfortunately most of us don’t make it this far with our resolutions. Set an initial ten week plan, with a reward for yourself at the end of it. If you make it that far, it does get much easier. The following link http://www.lets-get.com//uploads/article/60/files/Lets%20Get%20Moving.pdf takes you to a pack which helps you plan how to get more active, but the principles could also be used for healthy eating planning. There are numerous features on this website such as the activity search and recipe library that can help you achieve your new year’s resolution for 2015.